Since 2006 a sustained programme of research centred on the Cycladic island of Keros has transformed our understanding not only about this unique site but also about its place in the Early Bronze Age Cyclades. The Cycladic Seminar welcomes Dr. Michael Boyd (Senior Research Associateat the McDonald Institute for Archaeological Research, University of Cambridge). Dr. Boyd will address the topic: “The Keros sanctuary and the ‘Keros Triangle’: investigating Early Bronze Age terrestrial and maritime networks”. Since 2006 a sustained programme of research centred on the Cycladic island of Keros has transformed our understanding not only about this unique site but also about its place in the Early Bronze Age Cyclades. The programme has included excavation in the Special Deposit South and in the settlement on the islet of Dhaskalio, as well as survey on Keros and on Naxos. The excavations have determined the nature of the ritual practices conducted in the two Special Deposits and defined the site as the world’s earliest maritime sanctuary. Excavations on Dhaskalio have shown this to be a large and important centre with imposing architecture and a specialism in metalwork production. From the beginning it has always been clear that people and material were drawn to the sanctuary at Keros throughout its long history. Studies of different material culture categories have shown importation from near and far in the Cyclades and beyond, with little or no local production. 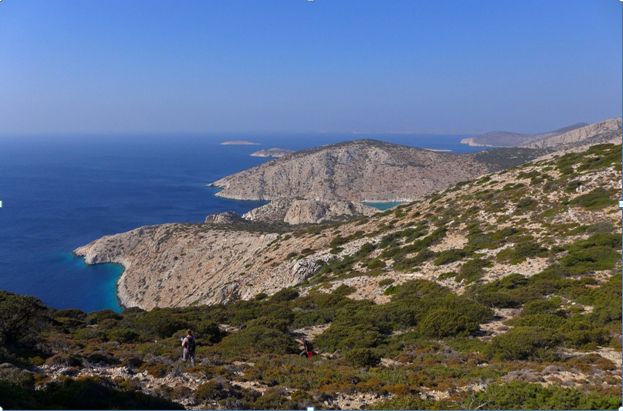 In order to further research on Keros’ place in a wider settlement and activity hierarchy, a programme of survey was conceived, initially on Keros itself and subsequently on the south coast of Naxos (and in 2018 survey will be conducted on the intervening island of Kato Kouphonisi). This integrated programme has confirmed that the sanctuary at Kavos is the largest and most sophisticated site in the survey region of this period. The landscape of Keros proved to be significantly more exploited in the Early Bronze Age than might have been expected: the presentation will discuss evidence for the scale and nature of activity on the Keros landscape in all prehistoric periods, and the implications for the role and nature of the Keros sanctuary. It will also present the results of the Southeast Naxos Survey, which has clarified the nature of habitation and land use there throughout prehistory. Survey data from later prehistory and later periods will also be briefly mentioned. The value of an integrated approach to excavation and survey will be discussed, placing the recent research at Keros in the broader light of the survey results, and possible future research avenues will be discussed.